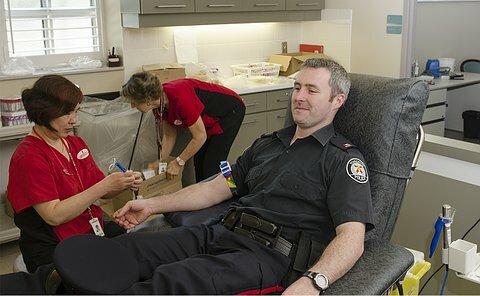 Police officers recruited students as life-long lifesavers, joining them in giving blood. Maryam Rashid said she have always thought making a blood donation, but never tried it before. 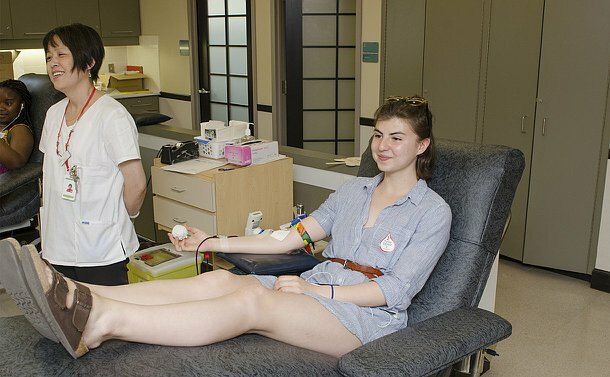 The Harbord Collegiate Grade 12 student finally got around to it on May 26 when she and fellow students joined 14 Division officers in donating blood at the Canadian Blood Services clinic at 67 College St.
Grade 11 student Annabel Hunter was happy to join her schoolmate at the event. The students and officers donated blood as part of the Students & Cops Saving Lives initiative. The initiative started in the last school year. “We had about 12 students and cops last year and our expectations this year are for about 40,” Mulatu said. Constables Patty Retsinas and Paul Gribbon were among the officers who made donations. Each whole-blood donation can be used to help three patients. Anyone wishing to donate blood or learn more can visit Canadian Blood Services at Blood.ca or call 1-888-2-DONATE (1-888-236-6283).